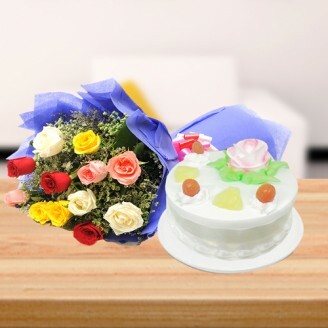 This combo consist bunch of 12 mix roses within a paper packing and a delicious Pineapple cake. This is an ultimate combo for impressing your loved ones on any special day or just trying to make them happy. Send your love and care wrapped in this gift through Giftjaipur.com. This gift combo signifies love and it is a perfect way to impress your special someone. Perfect gift for birthday, anniversary, wedding, or any other special festivals like Gudi Padwa, Durga Pooja, Karva Chauth and many more. Consume cake within 24 hours of delivery. Keep the cake in refrigerator. Diabetic should take distinct care while consuming the cake. Delivered product may vary to the image shown. You can increase the number of flowers or weight and size of cake as per your need.•	Delivery may not apply for timings like: Valentine’s Day, Mother’s Day, Father’s Day etc.